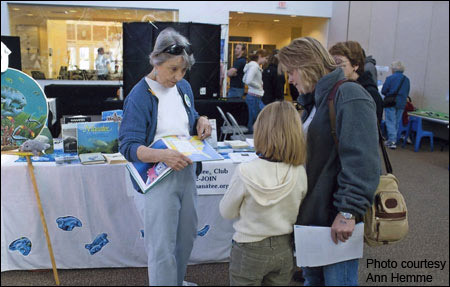 Save the Manatee Club volunteer Ann Hemme (above, center) shares information on manatee migration with visitors to the Florida Museum of Natural History in Gainesville. When Ann Hemme and Mary Bourassa retired from teaching, they may have left the regular workday behind, but they didn’t lose their love of learning or their interest in educating others. Instead, they found they had time for another love in their lives: endangered manatees. These days, you’ll find Ann and Mary putting their skills to work as valuable volunteers for Save the Manatee Club. 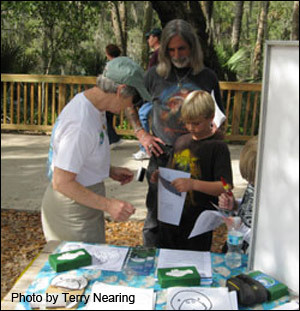 Ann Hemme (at left) interacts with young visitors to the Blue Spring Manatee Festival in Orange City, Florida. 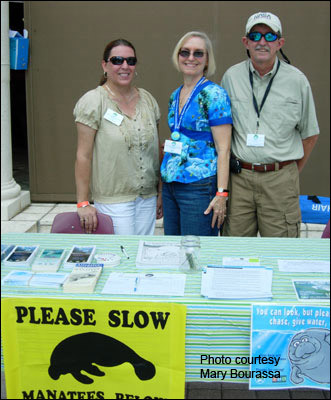 Hemme began her volunteer efforts by staffing education tables for Save the Manatee Club at art and environmental shows. “To add a little spice, I brought some of my manatee books, magazines, and other goodies to display with the Club literature,” she says. After showing her memorabilia on Collector’s Day at the Florida Museum of Natural History, she was asked to participate in the museum’s “Dr. Discover” children’s programs, which she continues to this day. Hemme helps staff SMC education booths at the Crystal River and Blue Spring manatee festivals. She is also a volunteer speaker for the Club and does presentations for school and community groups. And she’s always available to help a teacher or student on a manatee project. “I did a lesson one year for my daughter-in-law’s 3rd grade class, and I also supplied some grandchildren of friends the materials to do a 4th grade research project,” says Hemme. Knowing her love of manatees, friends bring her news articles and books. “I’m always on the lookout for info on the manatee,” she says. Mary Bourassa is nearly a Florida native. Originally from Illinois, her parents moved to Florida when she was just five years old and established a successful glass and hardware business in Ybor City. 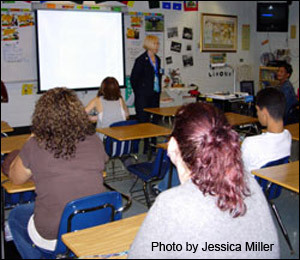 In 1971, Bourassa began teaching English at Eisenhower Junior High in Riverview, Florida, and later taught senior high and college classes in the Tampa Bay area. While teaching high school, Bourassa and a colleague co-sponsored an environmental club called “The Green Lions” and won first place in a manatee education contest sponsored by Save the Manatee Club. The group wrote and presented a manatee-related skit, organized a manatee drawing contest at a nearby elementary school, and displayed the drawings at Tampa’s Lowry Park Zoo for Earth Day. They also adopted many manatees from Save the Manatee Club. “That year, 1991, I adopted my first manatee, Ariel, who I’ve adopted every year since,” says Bourassa. SMC volunteer Mary Bourassa (center, top) and her colleague, Mary Freeney, give a manatee presentation at Leto High School in Tampa, prior to a kayak trip the students took to see manatees. When Bourassa retired from teaching in 2002, she decided to become more actively involved by volunteering for Save the Manatee Club. She started out by staffing education booths at festivals and events. “I soon drafted my husband to accompany me on weekends,” she says. Last year, Bourassa started doing speaking presentations on manatees at area schools. In addition, both Bourassa and Hemme participate on the Club’s Email Action Alert Team, sending messages to decision makers on a range of issues affecting manatees. Both Hemme and Bourassa believe teachers are a natural choice when it comes to doing volunteer work. “Teaching has honed my gift of gab, helped me to appreciate the potential of every human being individually, showed me the power of community involvement, and taught me to analyze and organize my approach to disseminating information to suit varying audiences,” says Bourassa. Hemme agrees, “Teaching gave me experience to be in front of a group and communicate so the audience could understand my message,” she says. (l-r) Save the Manatee Club volunteers Lisa Almeda and Mary and Omar Bourassa at Snooty’s 2009 birthday party at the Parker Manatee Aquarium in Bradenton, Florida. You can help manatees by becoming a Save the Manatee Club volunteer. SMC volunteers staff tables at manatee-related events, engage in speaking presentations, help out in the SMC offices, write letters and send e-mails on issues of concern to manatees, and report information to manatee researchers. YOU can make a difference for manatees! Interested? Get a description of volunteer positions and fill out our online volunteer application form.